Looking for a new job is not a cakewalk, but with all the new online tools, the search has become simpler. Making it even easier, Google has come up with a new tool that lets you find relevant jobs. The new tool is going live today, in the United States. Google first announced the new job search tool “Google for Jobs” at the I/O 2017 event. It is integrated into Google search and lists out jobs posted for your local area. The tool shows up on both mobile and desktop. It is geared with powerful filters and Google’s Cloud Jobs API that make a lethal combo in providing a seamless job search experience for the users. For now, Google has made it available in the United States for every job category. To maintain updated inventory of jobs, Google gets information from other job search domains like Monster, LinkedIn, WayUp, DirectEmployers, CareerBuilder, Glassdoor, and Facebook. The tech giant plans on adding more sources in the coming days. To ensure even more jobs are listed over time, we’re publishing open documentation for all jobs providers, from third-party platforms or direct employers, big or small, detailing how to make their job openings discoverable in this new feature. To use Google for Jobs, you just need to open the normal Google search on desktop or mobile and type in a job-related query in the search box e.g. 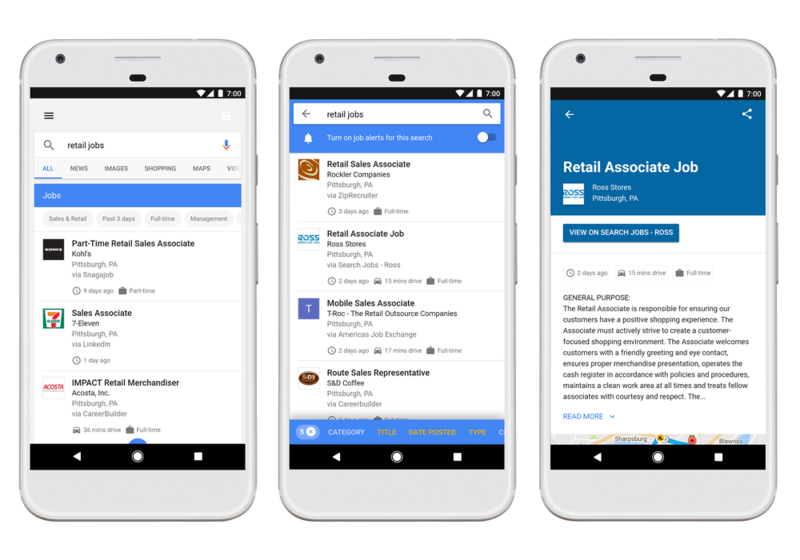 “jobs near me” or “technical jobs.” As soon as you fire up such job search query, Google for Jobs widget will appear consisting a collection of job listing with an array of filters. The tool also offers email alerts for your queries; you can activate e-mail alert to get the new jobs offers right in your inbox.